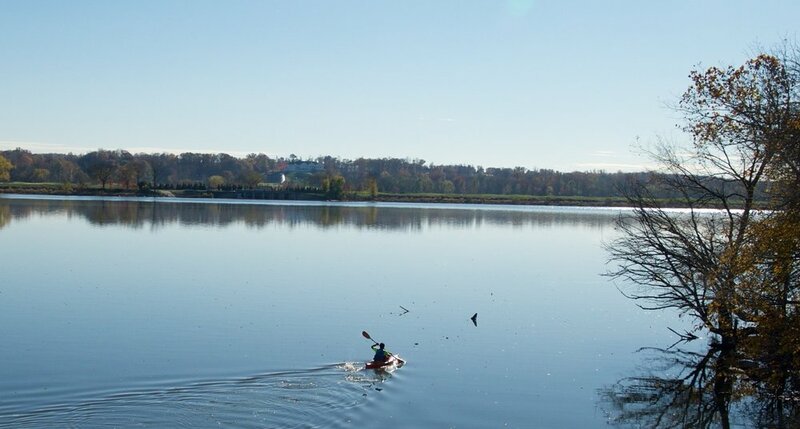 A kayaker on the potomac at Riley's Lock. Trump National Golf Club is in the distance. The state of public access to a popular stretch of river near Riley’s Lock is in limbo. On July 10, the US Coast Guard announced that a two-mile stretch of the Potomac would be closed to the public whenever the president golfs at Trump National along Virginia side of the river, directly across from Riley’s Lock. The decision caused an uproar among the local paddling community; Riley's is a popular put-in spot for Team River Runner, a nonprofit that empowers wounded veterans through paddling, Calleva, a local outfitter that hosts summer camps for kids, and local residents from Maryland, Virginia, and the District. Two weeks later, on July 25, the head of the Coast Guard, Admiral Paul F. Zukunft, unexpectedly announced an unofficial revision to the Coast Guard policy: paddlers will be allowed to use the stretch of river after all, but only on the Maryland side. It's unclear what the revised boundaries of the restricted area will be, or when those changes will take effect. And until they are reflected in writing, nothing is official. The public has until August 9 to weigh in on the policy. Potomac Conservancy's submitted statement is below. On behalf of our Board of Directors and our 21,000 river friends, Potomac Conservancy urges Admiral Paul F. Zukunft, Commandant of the U.S. Coast Guard, to consider changes to proposed rulemaking outlined in docket number USCG-2017-0448. While we agree that the security and safety of our elected officials and the public are of paramount importance, the interim security rule should be modified to maintain public access to this important navigable waterway. First, we urge the U.S. Coast Guard to identify additional methods of communication to paddlers, as most recreational paddlers do not carry marine radios onto the water with them. The U.S. Coast Guard, in partnership with other federal, state, and local agencies, should hold a public meeting to learn from the impacted community other, more effective methods of communication for times when the security zone is enacted. Second, we urge the U.S. Coast Guard to decrease the overall size of the security zone. The current zone stretches across the entire Potomac River, shoreline to shoreline, completely inhibiting public access through that area. If a security zone is necessary, we propose the U.S. Coast Guard decrease the size of the zone, to allow river users passage along the Maryland side of the river, up to a midpoint line drawn halfway between the two banks. While we appreciate comments made by Adm. Zukunft on Tuesday, July 25 while testifying before the House Transportation and Infrastructure Committee, which stated that recreational paddlers can use the Maryland side of the Potomac during the security zone, these comments must be included in the final rule to ensure the policy change is implemented accordingly. Finally, as the landowner of Sharpshin Island, a portion of which is included in the security zone, we urge the U.S. Coast Guard to recognize the variety of public uses – including conservation, recreation, rehabilitation, and education – that are threatened by the President’s continued use of the Trump National Golf Club. Joint Base Andrews hosts a secure golf course that could be a substitute golfing location that does not sacrifice public access.